Greece’s strained relationship with Turkey over the long standing territorial dispute in Cyprus, along with sovereignty rights issue in the Gulf of Aegean and military modernization initiatives is expected to drive the Greek defense expenditure. As a percentage of GDP, the country’s defense budget is expected to average 1.6% over the forecast period. Greek military expenditure, values US$3.6 billion in 2018, and registered a CAGR of -4.16% during the historic period. However, over the forecast period, the Greek defense expenditure is projected to increase at a CAGR of 2.82% to value US$4.2 billion in 2023. During the same time, the capital expenditure allocation, is projected to increase to an average of 17.5% over 2019-2023. This increase is primarily due to the procurement of advanced defense equipment and a focus on increasing the capabilities of the country’s indigenous defense industry. Various procurements that are expected to fuel the growth of capital spending over the forecast period include frigates, corvettes, and multi-role aircraft modernization and MRO services. The country’s lack of domestic defense capabilities juxtaposed to the extensive capabilities of its rival Turkish military, have forced Greece to procure sophisticated defense systems from foreign OEMs in order to strengthen the country’s strategic assets and protect critical infrastructure. The country’s domestic defense sector is still in its nascent stage, and is currently developing an expertise in electronic defense systems in the area of military communication, in order to export such systems in the future. The report "Future of the Greek Defense Industry - Market Attractiveness, Competitive Landscape and Forecasts to 2023" offers detailed analysis of the Greek defense industry with market size forecasts covering the next five years. This report will also analyze factors that influence demand for the industry, key market trends, and challenges faced by industry participants. Defense Industry Market Size and Drivers: detailed analysis of the Greek defense industry during 2019-2023, including highlights of the demand drivers and growth stimulators for the industry. It also provides a snapshot of the country’s expenditure and modernization patterns. Import and Export Dynamics: analysis of prevalent trends in the country’s imports and exports over the last five years. Market Opportunities: list of the top ten defense investment opportunities over the next 5 years. 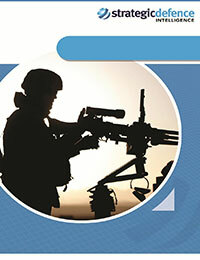 Competitive landscape and strategic insights: analysis of the competitive landscape of the Greek defense industry. Greek military expenditure, values US$3.6 billion in 2018, and registered a CAGR of -4.16% during the historic period. However, over the forecast period, the Greek defense expenditure is projected to increase at a CAGR of 2.82% to value US$4.2 billion in 2023. The country’s strained relationship with Turkey over the long standing territorial dispute in Cyprus, along with sovereignty rights issue in the Gulf of Aegean and military modernization initiatives is expected to drive the Greek defense expenditure over the forecast period. As a percentage of GDP, the country’s defense budget is expected to average 1.6% over the forecast period, compared to an average of 1.8% recorded during 2014-2018.